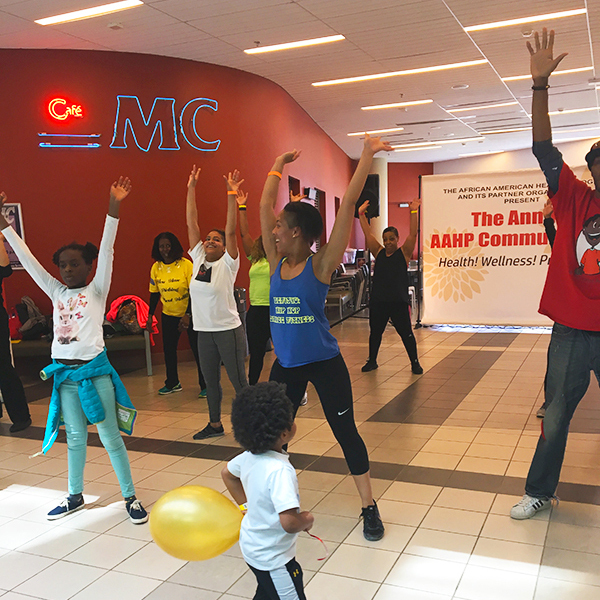 AAHP Community Day 2019 is Saturday, April 27! The African American Health Program has been delivering free, critical health services to Montgomery County residents since 1999. Introducing DMeetings, comprehensive online diabetes education courses, at your convenience. Join AAHP's Kickstart Your Health Classes to learn how to prevent and manage chronic disease. AAHP and its community partners invite all Montgomery County residents to join us for a day of family fun at AAHP Community Day 2019, taking place on Saturday, April 27 from 9:00 am - 2:00 pm at the Silver Spring Civic Center in Downtown Silver Spring. This year’s theme, “KNOW?” will encourage attendees to know their numbers and participate in AAHP's health screenings for blood pressure, cholesterol, blood sugar, body mass, etc. The day will kick off with “Genetics and Minority Health Care," a panel featuring a robust array of health experts. Attendees can enjoy various health related demonstrations, energizing group fitness activities, onsite health screenings, and interactive community information booths. The event will be a fun and interactive awareness program, focusing on childbirth and breastfeeding, HIV/AIDS prevention, diabetes prevention and management, oral health, mental health, stress management techniques, men’s health, cardiovascular disease, healthy eating, and physical fitness. Know? 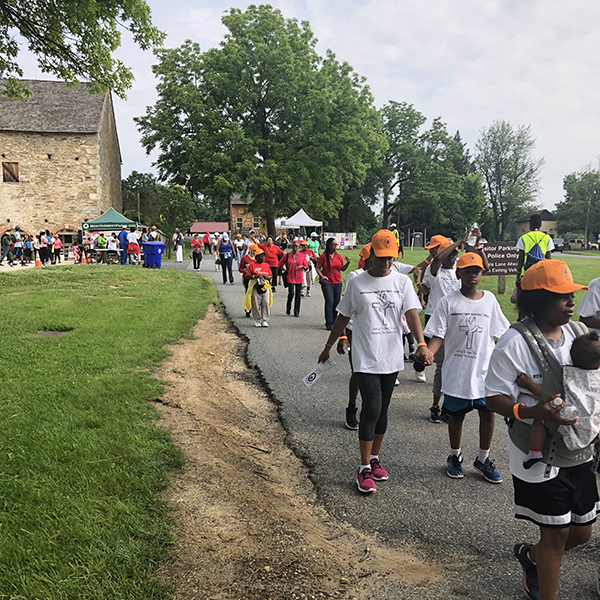 Community Day 2019 will showcase and celebrate AAHP’s mission for the health of Black Montgomery County residents. Mark your calendars for Saturday, April 27. 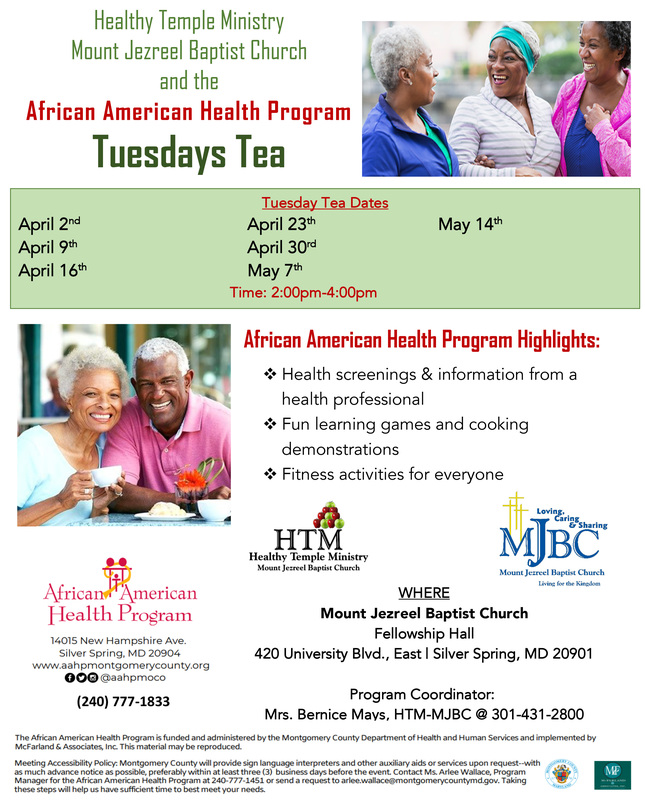 Email us at volunteer@aahpmontgomerycounty.org if you are interested in volunteering. RSVP at rsvp@aahpmontgomerycountry.org or eventbrite.com. August is National Breastfeeding Month. This month, AAHP will highlight the benefits of breastfeeding for both mother and baby and focus on supporting and encouraging breastfeeding among Black women. Black parents and parents-to-be in Montgomery County, feel free to share your stories and questions about breastfeeding on our social media channels throughout the month! This Black Breastfeeding Week, AAHP celebrates breastfeeding among Black women. Black breastfeeding rates are rising! According to the CDC, the 2004 National Immunization Survey reports 50% of Black children were breastfed, and the 2011-2015 Survey reports 64% of children were breastfed. Higher breastfeeding rates mean healthier babies, healthier mothers, and a healthier Black community. Breastfeeding is recognized as the best source of nutrition for infants, providing protection against common diseases and conditions such as ear infections, diarrhea, and asthma. Breastfed babies are also less likely to die from Sudden Infant Death Syndrome (SIDS) and are less likely to become obese or develop diabetes, high cholesterol, or high blood pressure later in life. For mothers, breastfeeding reduces the risk for breast cancer and diabetes. Unfortunately, many Black women have been unable to reap those benefits due to challenges that have made it harder to breastfeed, including lack of support from health care professionals and the need to return to work soon after giving birth. Because Black women need more targeted support for breastfeeding, AAHP’s S.M.I.L.E. Program provides invaluable education and guidance for pregnant and breastfeeding Black women in Montgomery County. AAHP observes Breastfeeding Awareness Month and Black Breastfeeding Week (August 25-31) by sharing information about breastfeeding and AAHP’s work in maternal and child health through the S.M.I.L.E. program. We invite you to follow our Facebook, Twitter, and Instagram accounts and contribute to the conversation by sharing your own stories about breastfeeding. Together, we can build a brighter, healthier future for our children. AAHP provides information and services based on six major focus areas. We provide education, counseling, support groups and case management to expecting mothers. WHY? Because Black women had the highest rate of preterm births and low birth weight compared to women of other races. WHY? Because Black infants are 3.2 times as likely to die from complications related to low birthweight as compared to non-Hispanic White infants. We conduct free classes and health screenings to help prevent and manage diabetes and heart disease. WHY? In recent years, Blacks had a life expectancy 3.4 years shorter than Whites, largely due to heart disease. WHY? Blacks are, on average, twice as likely to have diabetes as Whites. We provide cancer prevention, education, community outreach and referrals. WHY? Because Blacks have the highest death rate and shortest survival of any racial and ethnic group in the U.S. for most cancers. WHY? Because Black men and women are about twice as likely to die from colorectal cancer and breast cancer than White men and women, respectively. We provide free and confidential HIV testing and pre- and post-test counseling. WHY? Infection rates for chlamydia, gonorrhea, and syphilis have increased in Montgomery County, with Blacks having the highest rates. WHY? 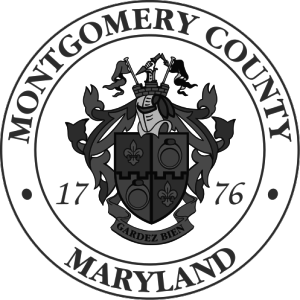 Because in 2016, in Montgomery County, five times more Blacks were diagnosed with HIV than Whites. We raise awareness and provide mental health education, screenings and referrals. WHY? Because Blacks are 10% more likely to report having serious psychological distress than Whites. WHY? Because Blacks are more likely to be misdiagnosed and to receive no or less adequate treatment for mental health disorders than Whites. We provide educational materials at community outreach events focusing on oral health and disease prevention. WHY? Blacks are among the groups with the poorest oral health compared to other races. WHY? During 2011-2014, 19% of Black children had untreated dental caries in their primary teeth compared to 10% of White children. During 2011–2014, 19% of Black children had untreated dental caries in their primary teeth, compared to 10% of White children. 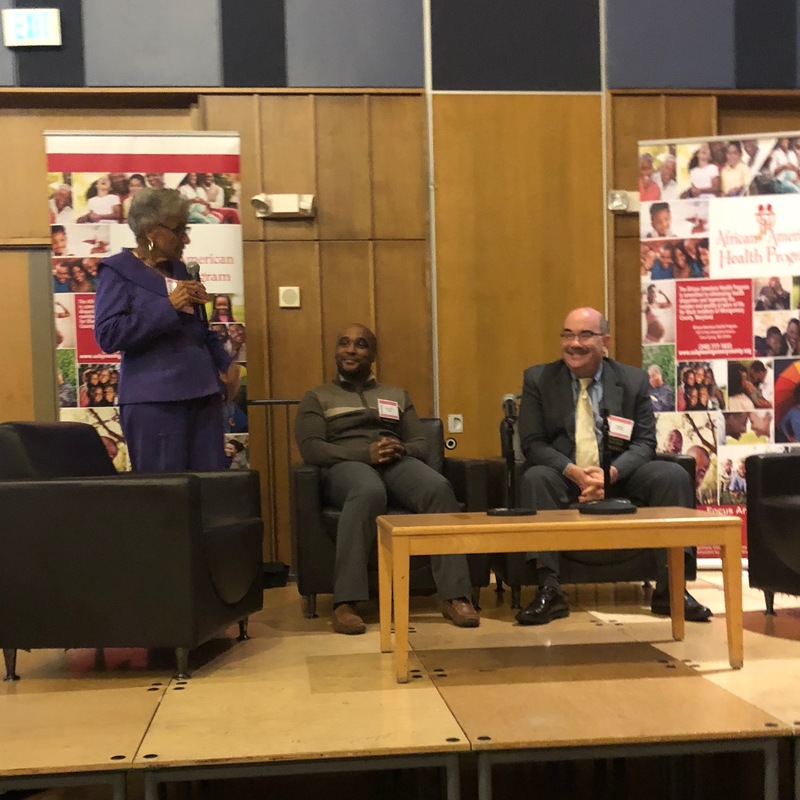 The African American Health Program (AAHP) is committed to eliminating health disparities and improving the number and quality of years of life for Black residents of Montgomery County, Maryland. AAHP's Executive Coalition's next meeting will be held on Thursday, January 11 from 6:30 pm - 8:30 pm at the Silver Spring Civic Building in the Spring Room. The topic of discussion will be community collaboration. AAHP's Chronic Disease Prevention and Management Classes at the Germantown Library will focus on cancer this January. On Tuesday, January 23, from 6 - 9 pm, the class will provide an overview of cancer and on Tuesday, January 30, from 6-9 pm, the class will focus on prostate, lung, and breast cancer. For a complete listing of AAHP's October events, please see our October calendar. Learn more about screening for colorectal cancer from Capital Digestive Care. Silver Spring resident Maurice Holtz discusses how he improved his health and lost weight by taking AAHP's diabetes education classes. Learn about AAHP's Kickstarting Your Health classes and DMeetings. Click on the photo or caption to view all photos from that gallery. No matter your age or health status, your health should be a priority. AAHP provides a wealth of resources and services to help any individual live a healthier life. Would you like to sign up for the AAHP newsletter?